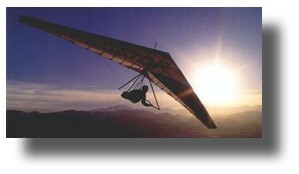 In 1976, Hang Gliding as a sport was in its infancy. It had only been a few years since the very first successful flight, and little was known about the aerodynamics of ultra light flight. 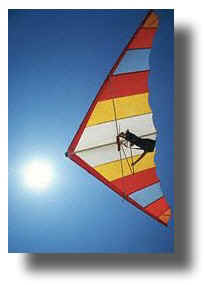 Pilots were only just beginning to recognize the need to understand micrometeorology (small scale wind and weather conditions) - unique to Hang Gliding. New records for height, duration, and distance were being achieved regularly, and pilots like myself - constantly pushing the limits, regularly encountered new conditions. 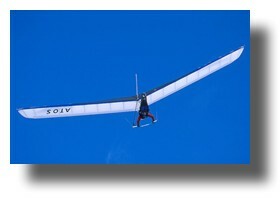 Gliders were changing rapidly, and many of the early lessons about glider design were achieved through trial and error - often at the risk of injury or death. Some of my friends and fellow-pilots didn’t make it. Although the Cirrus III I was flying at Lookout Mountain, Colorado that September day was specially reinforced to handle the stress of aerobatic maneuvers, it will perhaps never be known if it was stable under those conditions. In the middle of a high-speed wingover at 1200 feet above the ground, it disintegrated. As I plummeted to Earth, I saw only rocks and giant boulders below me, and I knew with utter certainty that I had only seconds to live. There was no question in my mind that I was going to die. My life didn't flash before me; I didn't have time to be afraid. I made a futile attempt to break my fall, but of course it was useless. In just a few short seconds I would impact the Earth at terminal velocity. I awoke a few seconds or a few minutes later. I don't know how long, because I blacked out just before I hit. When I awoke, I found myself swinging gently a foot or so off the ground in my harness. I didn't move for a little while, and was surprised to learn that being dead was very much like being alive! You see, I was certain that I had died. Eventually, I put a foot down, stood up, and removed my harness. I was still surprised that death was so much like living. When I looked up, I saw that I had somehow hit the lone tree in the middle of a vast boulder field. My harness was still attached to the shredded remains of the glider, which had somehow snagged on the highest tree limbs, and had lowered me into a gentle swing just 12 inches from the ground. I looked to see if I was injured, but could find nothing more than a tiny scratch. Within a few minutes some friends and fellow-pilots who had witnessed the event came running, out of breath, over a small embankment. It was only when I saw them that I realized I might not be dead after all! They simply couldn't believe that I had survived, because they had witnessed first hand the spectacular headlong plummet from the heavens. After I realized that I would live, my first and only thought was that I needed another glider if I was going to fly the next day. I knew if I didn't get back in the air right away, I might never return to the sky I loved so dearly. And of course I knew how to avoid the same mistake in the future. So why be frightened? The next day I was flying gracefully again in the Colorado sky. It wasn't until later that I received a message. But then that's another tale.